Dublin-based animation studio Jam Media has secured a lucrative toy deal with Jakks Pacific, one of the largest toy manufactures in the world, to produce and sell a large selection of products based on the studio’s hit children’s TV series ‘Becca’s Bunch’. According to the Sunday Independent, the licensing agreement with the Californian-based manufacturer will see Jam Media secure an initial seven-figure sum along with a percentage of the merchandise sold. This deal is said to be the result of two years of negotiations and will see merchandise based on the series being made available in toy stores in the autumn. Jam Media initially signed an exclusive deal with Nickelodeon for the broadcast rights to the series in the US and Pay TV rights for the rest of the world back in 2016. Since then, ‘Becca’s Bunch’ has emerged on top of the ratings list in the UK and continues to grow in the US. “[The toy deal was] ‘the icing on the cake’ [for Becca's success and would be] ‘liberating’ [for the company.] ‘It is generating revenue while you sleep. 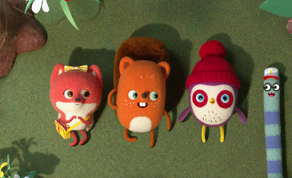 It will allow us to grow that bit faster and we have already been approached by other toy manufacturers with ideas for TV series, which is new for us.’"
The second series of ‘Becca’s Bunch’ is currently in development, with Jam Media also working on projects with Dreamworks, Netflix, and the BBC.